Techniques of Machining Wood carries on the learning process of safely and effectively building furniture. This course focuses primarily on power tools and machines. As part of the milling process, you will use the jointer, planer, and table saws. In addition to dimensioning the wood for your project, instruction on the table saw will include cutting tongue-and-grooves with a dado blade, and the use of the tapering jig. You will learn to use the router with a jig to make half-blind dovetails, and the router table to chamfer an edge and make grooves. The Festool Domino will be used for joinery. All of these techniques will be taught in detail so you will have a thorough understanding of how the machines operate and how to safely use them. At the conclusion of this course you will walk away with an entryway table and valuable skills and experience in using the most common power tools found in a home workshop. Tuesdays, 12:00-2:30 pm, or 6:30-9:00 pm, May 21 – July 23. Note: when you register through PayPal, we receive your registration. You will not receive a separate confirmation from the school. See you in class! 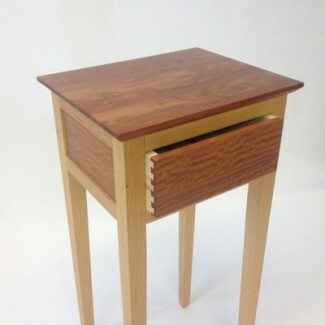 The final course of a three course series, Techniques of Machining Wood, advances students knowledge of various woodworking machines and culminates with the construction of a challenging entryway table. Students are required to purchase some tools (see Resources) and materials (see ‘Cut List’ below) needed for this class. You will be required to bring a notebook, pen, and pencil. Wear comfortable clothing that you don’t mind getting saw-dusty.